Welcome to the "What's New" page which is guess what? Yes, it's new, as is the Friends of Paul Gruchow page. Check them out. Available for download "The Meaning of Natural History" by Paul Gruchow (from Download page) July 2017. In September 2014 I began my journey to North India. Usually I travel without any plan. This time I had at least a vague idea. 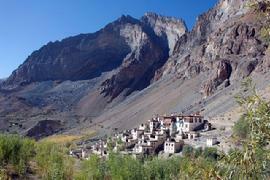 I wanted to journey to Lingshed, a tiny village in the Ladakh part of the Indian states of Jammu and Kashmir. In Lingshed about 250 people are living together and are self-sustaining. One of the last Tibetan monasteries in the Gelug Tradition is still functioning, and there is a school where I hope to do some teaching for awhile. Some months before my trip, I had e-mail contact with Dieter Glogowski, an author and photographer. He spent many years in this region of India, published picture books and made wonderful slide-shows about it. He provided me with the address of my most important contact person – Karma – who ensured me before I left that I would be very welcome in Lingshed and that the family of his nephew, Tashi Tundup, would look forward to having me as their house guest. I’m overwhelmed by the uncomplicated hospitality and openness of these people to whom I am a stranger. 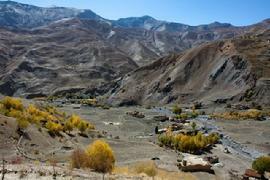 I fly to Leh (the capital of Ladakh) by way of Delhi. 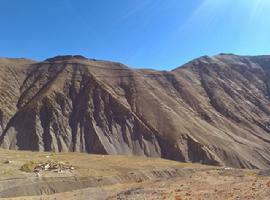 The journey to Leh is easy except for the adjustment to altitude -- 3700 meters above sea level. Soon, my discomfort increased. Lingshed lies north of the Himalaya crest --4000 meters high. From the point where the road ends, I could only reach my destination on foot. Tundup, Karma’s nephew, and our “donkeyman”, Namgyal, lead me for four days with two heavily-packed donkeys through mountain passes above 5000 meters. This region is one of the few areas on earth which is still untouched. On the way I was confronted with scenes of nature which were breathtaking. We rarely met another human being. The last steep path lead us finally to Lingshed, whose houses are widely spread on the hills and in the valley in a very picturesque way. Looking at this scenery for the first time I was shaking. In Lingshed – a village where time seems to have stopped -- you live life as people did many centuries ago, far from civilization. It seems a simple but very happy life. In this moment which I have desired for a long time, my heart beating wildly, I was not yet aware how much Lingshed is going to give me. Even though I’ve travelled a great deal and have been a guest in many houses all over the world, looking at this peaceful, authentic place for the first time, I’m not able to imagine how pure its hospitality, warmth, and life will be. In Lingshed I lived with a family who taught me what trust, serenity, tolerance and togetherness mean – and what it means to care for the old as well as the young. I learned from Angmo, who is five years younger than me, how to live a simple and uncomplicated life. From the first moment there her house became mine, and no one ever asked how long I wanted to stay! At the village school I was welcomed as much as I was in each of Lingshed’s homes. Every morning I climbed for 45 minutes to reach the schoolhouse situated high above the village – only the monastery is higher. “Welcome teacher!” shouted the pupils when I passed their classrooms without doors. They all wanted me to come and teach them something, singing their songs for me – unusual melodies to my ears, but beautiful! My songs. which are far from the sound of their Ladakhi music, were difficult for them. “If I just had a piano!“ I sighed while talking to the headmaster. “Piano?“ he asked and so I explained to him as well as I could what it is. “Paiano?” he asked a second time, pronouncing the word incorrectly, but in an excited tone. “Tomorrow it will come!” he says. I shake my head, smiling. Surely not, I say. That’s impossible: a piano… across the Himalaya? “Yes, yes! From England!” I think of a keyboard and try again and again to understand the impossible. I cannot imagine this, as wonderful as it would be. And then it really does come! I’m living a miracle. For four days I’m in a state of something unbelievable, surrounded by thrilled children and lots of music. 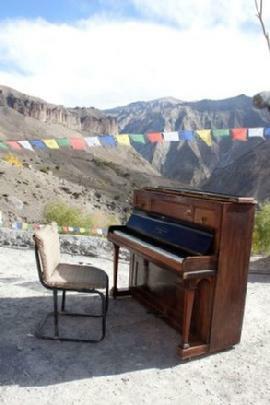 A British film team brought a piano across the Himalayas. 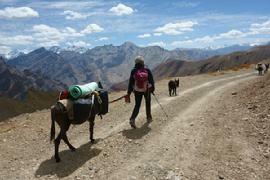 They carry it with the help of Yaks, horses and strong men. 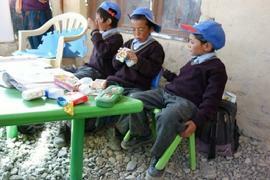 They are heading for the place where I’m trying hard to teach Ladakhi children to sing harmonious melodies. Now, I realize there are no coincidences! The English crew came to film a documentary. They are like a whirlwind in the midst of the school's life. They dance and sing and we organize a concert, together. More than a hundred schoolchildren get big eyes and ears when they listen to Mozart played on this old wooden box for the first time. Today, I am there again, reliving the miracle. The old piano is sitting on the platform in front of the school dining hall on the gravel ground. The colorful prayer flags are moving in the wind and in the background there is a breathtaking view of Lingshed and the mountains beyond. My second class is standing proud near the piano singing their song from the bottom of their hearts, “I live in Ladakh“, which I’ve written for them. When the British crew is leaving, I feel a sort of “quiet after the storm”. I try to teach a very interested lady-teacher how to play the instrument. Soon, Lingshed begins preparing for the coming winter. 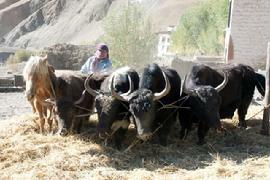 The barley harvest is threshed with yaks and horses and is separated from chaff with help from the wind. Dried grass is gathered and put on the roofs of houses. The Indian government will send the yearly ration of rice and wheat as well as some goats. These goods are distributed among families in the area. Sadly, inevitably, it becomes time to leave. Angmo – advanced in pregnancy – has to check into the hospital in Leh 4 weeks before the birthdate. The difficult journey would be too dangerous at a later date. It is time to say goodbye to the harmony and peace of this wonderful place and to the people who have become my close friends. It’s sad to bid their friendly faces and their happy “Juleys” farewell – perhaps forever. I become more aware than ever that I've been miles away from my world. Whenever I wish to see these people again, I must come back. Here there are no postal addresses, no telephones reaching Germany, no internet. Crying, they show me their sadness. I am deeply moved and profoundly thankful for the great gift of themselves they have given me. They do not accept money, so I accept their gift and feel I cannot give them anything in return. 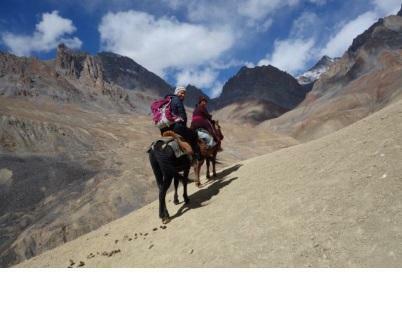 Nine of us travel back to Leh by horse and eventually, car. Only in this way can people from Lingshed afford the cost. I ride on Tashi Tundup’s horse behind Angmo who is urging her horse across the steep hills shouting “tchu tchu!” in a loud voice. I’m sitting in an uncomfortable wooden saddle and hope that my horse won’t stumble. Later, two drivers of an old Jeep change places to share the front passenger seat with me. When we arrive in Leh it is dark and raining. The people there seem strange and less warm. Before my time in Lingshed I had felt they were very friendly compared to my compatriots. In the coming weeks Angmo will be waiting lonely in a little room near the hospital until she gives birth to her baby. After another four weeks she must take the suckling infant across a frozen river (the Chaddar Treck is one of the most dangerous paths in the world), or she will be flown back to Lingshed by a helicopter from the Indian military. Back in Leh I’m spending some days with Angmo, my new friend and wonderful teacher of the really important things. The days grow colder and there are only a few tourists still in town. “June, July! Angmo no work!“ she repeats often. “Skyod le!” (Welcome!) 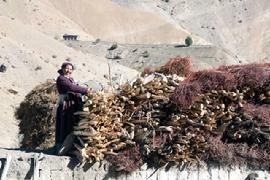 She wants me to come back so she can present me to her family living in Zanskar – beyond Lingshed. In summer she won't have as much work to do. I know she really means the invitation, and at this very moment I realize where I will spend my summer next year. Taylor Brorby's (Writers Rising Up Paul Gruchow) winning essay "Prairie Grass"
Sixty-five million years ago, when dinosaurs were freshly extinct and the western half of North America buckled and folded like sea waves, sediment splintered as wind, ice, streams, and rivers shaped and broke the soil, creating the Rocky Mountains. The sediment slid down the eastern slopes of rough rock, was carried across the land through river and stream channels, and set down like seeds in North Dakota. Throughout Montana, Idaho, and South Dakota, volcanoes spewed and belched embers into the air. Wind swirled and deposited ash among the mud and silt from the infant Rockies. Bit by bit, sandstone, siltstone, and mudstone settled amidst the emerging prairie. Plants blossomed and wilted as flesh and sand and bone and rock continued to press and crush across the millennia, coloring and contrasting different strata throughout the Badlands. Still, today, with annual rainfall of fifteen inches--most rain coming in downpours--water continues to shape and nourish the landscape of western North Dakota, quilting the prairie with grass. From afar it looks huge: acres of wheat bursting through the soil, reaching towards the sky, vast and intimidating. I am eight and am enveloped in a sea of golden husks. Stiff and strong, they prick my face as I lie down. The sun is shining and a few clouds dapple the sky. I close my eyes and hear the rush of the wind as it streaks through the amber waves of grain around me. This is my America: quiet to most but insanely alive. I sit on the coarse soil. Some clumps of dirt give way to my weight and collapse into dust. I think of how unique this is; how I am the only one doing this in the field behind my house. I never see anyone else run and disappear in an ocean of wheat. While lying down I feel like a fox, unseen and easily able to surprise anyone or thing that comes my way. In the earth that crumbles there are worms, above me insects hover and hawks look for any field mouse who dares to mistakenly leave the safety of his burrow. I tend to think this field is chaos. It is, isn't it? I mean, from afar the reason I love running through it is because its hugeness invites me to; just like a lake, it begs to be disturbed. But from down here it's ordered. And this field is ordered: rows upon rows sewn into the broken earth, trusted by the farmer that his measly seeds will break through the earth yet again and bring in a bountiful harvest. I'm thankful for something as ordinary as this field: it brings me into the business of the bees and worms and grain constantly growing and changing and depending upon each other in the way that I long to depend on others--in a necessary way to let life keep on going. In 2013, the North Dakota Attorney General, Wayne Stenehjem, created a plan to set aside eighteen Extraordinary Places in the state. Worry over the rapid and rampant development of shale oil in western North Dakota caused some residents to fear for their favorite geological features. Pretty Butte, one of the eighteen, is bricked on the border of Montana and North Dakota. Solitary and rugged, the butte rises like a ship’s sail on the horizon. Located dozens of miles south of Beach, North Dakota, Pretty Butte is the natural skyscraper in this uninhabited land. No road to Pretty Butte appears on a printed map. In July, sweet clover carpets the prairie in golden regalia, creating an ocean of yellow. Badgers, jack rabbits, rattlesnakes, deer, sage grouse, and pronghorn antelope navigate among the wash of a lemon-colored landscape. Coumarin, a vanilla-scented compound, gives clover its characteristically sweet smell, draping the dusty and dry prairie in a baked perfume. In childhood I never knew about Pretty Butte, traversing through the North Dakota Badlands on family vacations to and from Billings, Montana, along Interstate 94. Like other gems of the prairie, Pretty Butte is far from town. I decided to travel to Pretty Butte, seeing this Extraordinary Place for myself. Growing up amid stories of Lewis and Clark, George Catlin, and Theodore Roosevelt I believed myself to be a hearty pursuer of beauty in a broken landscape. Extraordinary is a relative term. In flyover country the scenery is often painted dull yellow at best and labeled drab brown. Ocher, sienna, and sepia stir little in many people’s imaginations, reminding them of vintage family photographs shut away in shoeboxes in tucked-away corners of closets. It makes sense that few people covet the land of the northern Great Plains. Near Pretty Butte clover ends and bentonite begins, a layer of clay commonly associated with coal, though the color varies from black, to ash, to bone-white, to grey. Subtly in hue is the speciality of the land surrounding Pretty Butte. At times, driving along Old Highway 16 feels something akin to the lava rock of Hawaii, where bends in the broken roadway reveal sweeping strawberry red scoria and onyx colored coal. Cottonwood trees mark rain-fed gullies and dry creek beds awaiting a summer slosh of rain. For miles the only sign of development, apart from the roadway, are rusted weather vanes marking former attempts at farming and ranching among the bad lands of western North Dakota. When Melville stood on the banks of the Mississippi, gazing into what would become the Breadbasket of the continent, he stood stock-still in wonderment. The grass, he said, the grass is a mightier ocean than my Atlantic. On the prairie, ocher and sienna snap against a curtain of cobalt, creating a tapestry of tones, dancing across a line of sky. In a world of roots, there is security in color. Yet in my deep core there is a yearning for a rootedness to place, a place where sage floats and the sweet scent of bluebell whirls during afternoon hikes. The prairie of my childhood imbues my body. Clip, clip; trim, trim. Americans cut, mow, fertilize, design, and imagine their yards, their own minature kingdoms of grass. Ribboned throughout neighborhoods from Phoenix to Chicago, Atlanta to Bangor, Kentucky Bluegrass mats much of America; a grass that fits the framework of a one-size-fits-all lawn model. When ships hauled Europeans to the New World, many brought Kentucky Bluegrass seeds and introduced it into the soil of North America. Centuries later, when grass became “managed,” we zoned and qualified roots based on aesthetic appeals, forgetting that there are more colors than green in a tapestried landscape. Sage swirls in my nostrils amid dry dirt, the texture of baking flour. I squint from the top of Pretty Butte, gazing into Montana, Indiangrass brushing my sun-warmed calves. Indiangrass, what the Lakota called “red grass with fluffy light-colored end,” swings atop the crown of Pretty Butte, ungulates like ripples across a lake. I grab the grass, run my dirtcoated hands along its weathered stock to the crown, where, like a firework, frills explode outward, giving the grass weight against the prairie wind that seeks to snap it to the soil. Grass whispers on the prairie. Early in the morning, when I dream in the Badlands of western North Dakota, voices of sage, big bluestem, and switchgrass swirl in my ears, dance in the drums of my canals, and, as they finger their way over scoria and clay, head east across the Great Plains. Grass contemplates growth. Before unfurling towards the sky, prairie grass shoots down deep roots, securing itself to the soil, sowing itself to the land before emerging. The prairie, forever expansive, cannot be taken in; no camera picture recreates the grandeur and scale of the patchwork of grass. The prairie washes over you. The prairie, like the ocean, defies human perception. As a child, I ran towards the horizon, sprinted over the flowing hills, and through muddy creeks, trying to reach the line that was forever present and constantly elusive. Like the pot of gold at the end of the rainbow, I could never find it, but it seemed right under my feet, somewhere. North Dakota contains nearly one-third of the nation’s National Grasslands. In western North Dakota, before the roughhewn palette of purples and pinks and grays and browns of the Badlands, the grass undulates and pulses, ripples and roils, whips and waves against a canvas of gold and brown and blue. The grass, when flicked by the wind, snaps against the sky. If I went hiking with you, showed you indiangrass, sideoats grama, junegrass, buffalograss, and foxtail barley, would you care? Would you imprint their images upon your mind and recognize the necessity of a community of roots, and stalks, and stems? And I wonder, too, if there isn’t a lesson to be learned in the prairie. A lesson against verticality, that highlights expansiveness. Bluffs, buttes, mesas, and trees imprint outlines against a billow of sky, furnishing vantage points in a fibered world of foliage. But the prairie proves too large for the eye’s desire of height; sweeping against rugged rock, grass must be appreciated from the ground, where roots anchor sturdy, sleek stalks in crevices of clay and stone and dirt. A square-yard of prairie holds 150 miles of roots, weaving, coursing, meandering like a river of pleasure, searching and securing grass in a land of wind. Perhaps this is why I return to the prairie: While climbing and stumbling among the grass and scoria, sage and clay, I long for a place to call home, a place to return to that does not bear the burden of a fast-moving world, a place where I can stumble and trip over clover and gaze in wide-eyed wonder at flowers, where I can forget my own needs and wants, and root myself to the land I love.